Honey and bee pollen both come from honey bees. While conventional honey is processed through filtration and heating, raw honey is unprocessed. A small amount of pollen can get mixed in with honey accidentally when people harvest it, and this is especially the case in raw honey because it's not filtered. Bee pollen is edible and is also sold on the market as a health food product. Raw honey is a good source of carbohydrates, which fuel brain and muscle function. It provides 17 grams of carbs and 64 calories per tablespoon. But it's not a good source of micro-nutrients, such as vitamins and minerals. Bee pollen is composed of about 55 percent carbs and 30 percent protein, which makes it a better protein source than honey. It does contain many vitamins and minerals, but only in trace amounts, so it shouldn't be considered a good source of micro-nutrients. 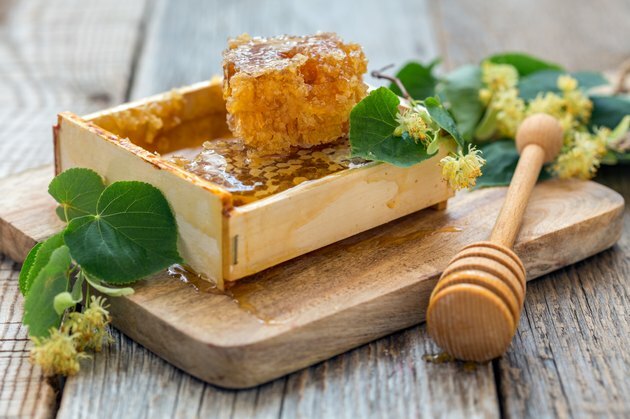 According to a review published in the "Iranian Journal of Basic Medical Sciences" in 2013, raw honey has historically been used as medicine around the world for treating wounds and intestinal, liver and heart problems. Though modern science has not proved its effectiveness in treating all these ailments, recent clinical trials have confirmed its anti-inflammatory effect and antimicrobial activity against different strains of bacteria. Modern clinical evidence of the medicinal properties of bee pollen is lacking. People use it to improve athletic performance and memory, prevent hay fever and treat respiratory infections, endocrine problems and colitis. Bee pollen can be swallowed in tablets or eaten as food. It has a sweet taste and can be added to granola, cereal or yogurt, sprinkled on salads or included in smoothies. Use raw honey as a natural sweetener in drinks, smoothies and desserts. You can also eat it on toast or mix it with peanut butter to make a dip for fruits and vegetables. Because it's rich in calories and carbohydrates, eating honey before a sports event or high-intensity workout can fuel you up, and eating it shortly afterward can give your body the energy to recover. Do not give raw honey to children under 1 year old. Due to its high sugar content, diabetics should consume honey only in very small amounts and combine it with less sugary foods to avoid blood sugar spikes. The sugar in honey can promote tooth erosion and decay. Dietary amounts of bee pollen have not been determined. To be safe, don't take more than the daily dose recommended by the manufacturer of any bee pollen you buy. People who are allergic to pollen may have a reaction to even small amounts of bee pollen. Store bee pollen in a refrigerator or freezer. It loses its nutritional content when exposed to heat and sunlight. Mother Nature Network: What's the Buzz on Bee Pollen?